Bill Shook designed the RD 205 hub to achieve four goals, stiff, strong, light and reliable. 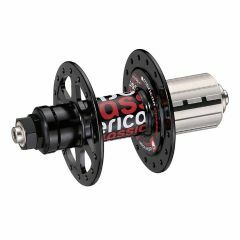 At 205 grams, it is one of the lightest, quiet riding hubs on the market. The large diameter 17mm axle is stiff and maintains proper bearing alignment under all riding conditions. The flange spacing was designed for optimal dishing. The hub shell supports the bearings as wide as possible for maximum leverage to reduce the load on the bearing and stiffen the hub. The 19mm diameter drive side end cap is made of serrated steel for better grip on the frame. Adjustable bearings and patented sleeve technology for ease of adjustment and improved bearing life. Every part of the RD 205 has been engineered and thoroughly tested for fast, reliable racing and riding.